​Watch a video in its ENTIRETY BEFORE TRYING to complete instructions with your robot. Diagram of all sensors and motors connected during firmware update. View the video to understand how to update the firmware of each component. 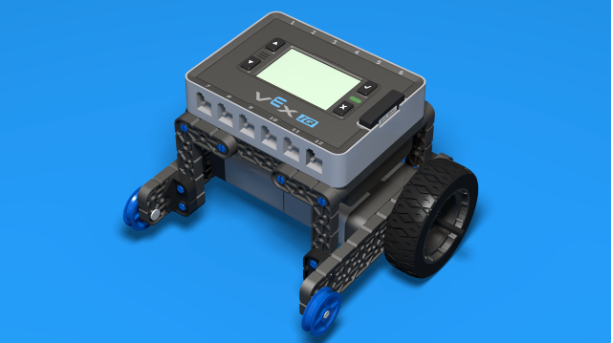 VEXos is a robotics operating system that harnesses the flexibility and power of VEX hardware for the rigors of competition and the diverse needs of education. 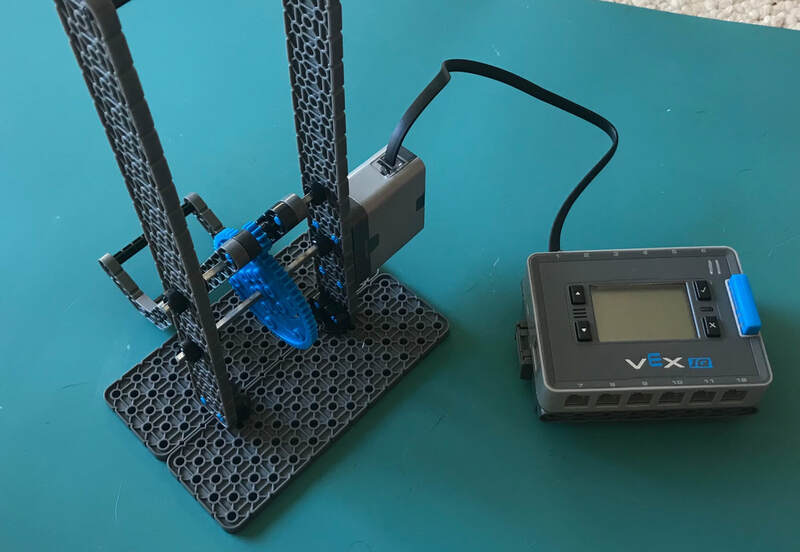 This operating system, written completely by VEX Robotics, uses real-time processing for repeatable operation at the fastest possible speeds. 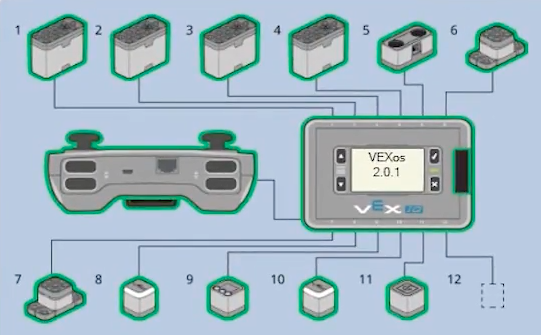 The "VEXos Utility" program simplifies updating VEX IQ hardware, and is compatible with Windows 7-10, and Mac OS X 10.10 and greater. All of the VEX IQ Smart Devices (Robot Brain, Controller, Smart Motor, and sensors) contain their own internal processors and run special software. This software is what allows for advanced programming features. The best way to ensure that your VEX IQ system is functioning properly is to keep the Robot's software up to date. NOTE: Due to a software update, the computer application will look like the image below. The computer program is the "VEXos Utility" found in the Applications folder, not the Firmware updater. Watch the video to understand how to pair the robot brain to the controller so you can use the controller without using a tether cable. Calibration is the action of checking your devices to make sure that the scaled steps are working properly. ​Watch the video to understand WHY controllers should be calibrated and HOW to calibrate the controller. Your robot brain needs to be paired to an iPad BEFORE continuing with any further steps. See a teacher if you suspect your iPad is NOT already paired to your robot brain. Watch the video to understand how to create a basic program for the drivetrain using the Modkit for VEX app. Watch the video clip to understand how to execute an autonomous program from the iPad app, "Modkit for VEX." 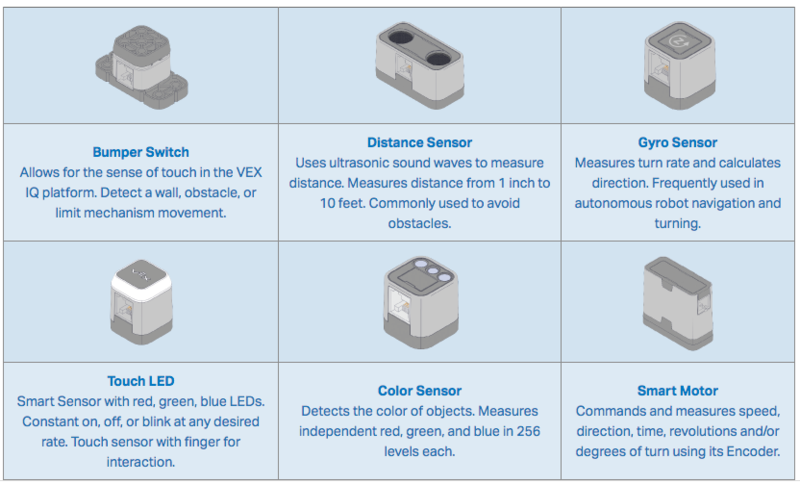 Discover the name of each sensor and determine how each can be used to program a robot's actions. ​NOTE: ​Be mindful that the purpose of downloading a pdf file is a precaution to take, in case wireless internet is not accessible. Pre-made instructions for various robot designs. Remember, you will need to create a design that solves YOUR problem. These can serve to help you understand the components you may want to use to create your final design. Instructions to build the VEX IQ Easy Bot by FLL Casts.